This page is about the medium tank Leopard A1A1 (L/44). For other uses, see Leopard (Family). The Leopard A1A1 (L/44) is a gift rank VI German medium tank with a battle rating of 8.7 (AB/RB/SB). It was introduced in Update 1.81 "The Valkyries". Players who have purchased the Leopard A1A1 L44 should be familiar with the armor of non-premium Leopard 1s. If not, the Leopard may not be what people expect a tank to be. It was developed before composite materials were discovered at a time where HEAT shells were so effective that in order for armour to be effective, it would be so thick that it would not be practical. Hence, the designers of Leopard 1s, knowing that there was no possible way of stopping HEAT rounds, removed the concept of armor. In essence, the Leopard A1A1 has no armor. The front hull, accounting slope, is only some 130mm thick. The turret and gun mantle is some 100mm depending on angle. BMP-2's auto-cannon, racked with APDS, will penetrate your turret and will cause major damage. Any HEAT projectile impacting the tank will likely result in instantly being destroyed. However, the engine block can at times reliably save the crew from HEAT shells. APDS and APFSDS are a different story. 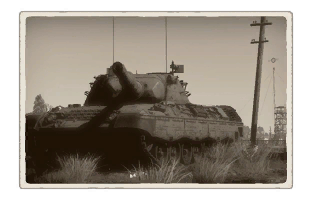 The armor on the Leopard A1A1 is so thin that most non-explosive-filled shells will seldom cause spalling upon penetrating the side of the tank. Frontal penetrations will cause much more damage, as the armor is just enough to cause spalling. The ready rack ammo is stored vertically within your turret to the left side of the tank. So AP penetrations to the right side of your tank may not set off the ammo. But, 3/4 of your crew are sited in a single file on the right side. So a penetration will knock you out nonetheless. Try to take no more than 20 shells, as it will increase the likelihood of ammo cook-off. The point is not to get hit, because if anything hits you, it will go through, and it will cause damage. In some cases, you could operate the tank backwards and use your engine block as shield, as most HEAT shells will be absorbed by your transmission, radiator and engine. The mobility of the Leopard A1A1 is between the XM-1 and T-55AM-1. Forward speed off road, expect some 40-50km/h. Reverse is about 15km/h off road. The neutral steering is absolutely amazing, you are able to swivel your tank easily. The suspensions are also great, very soft with great dampening effects, so expect a smooth drive. The legendary 120mm Rheinmetall L44 cannon does not fall short of its name. You get access to only two types of shells, APFSDS and HEAT-FS. Although the APFSDS sounds like a decent option, it actually isn’t. Apart from the fact that it cost SL to use, it also isn't very good at destroying your greatest threats: BMPs. Most times, the APFSDS will fly right through lightly armored vehicles with its 390mm penetration. The HEAT-FS, on the other hand, will result in hull-breaks on lightly armored targets while also being free of cost. The 120 mm HEAT with its 650mm penetration is able hull-break Object 120s and 906s, and anything that's not a MBT. For example, you can hit the tracks of an anti-aircraft vehicle, and it will hull-break. As such, the HEAT-FS has some more favorable characteristics than the APFSDS, while also retaining the fast velocity of 1100m/s, so it is quite easy to aim. Note that the "Stabilized" gun is only really stable when travelling under 30km/h. The Leopard A1A1 (L/44) is armed with two MG 3A1s, which fires a 7.62 mm round. However, these are more of deterrents to helicopters, as the small caliber bullets will rarely cause critical damage to helicopters.